'Adding text after the tag block'. In this post I'll explain how these actions can help you increase your productivity in your day to day application development. As we can see in the above screenshot, a condition 'cffunction tag with attribute access is Any value' is specified (i.e. the tag search engine would search for cffunction tags whose access attribute will be any value). 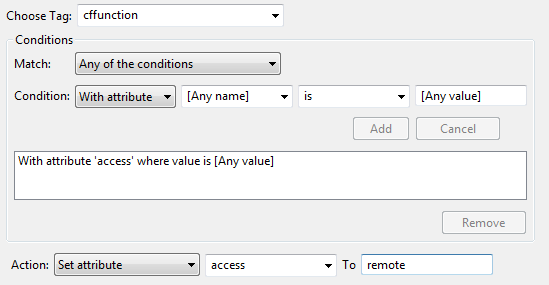 The action selected is Set attribute with attribute access selected with its value set to remote. On clicking 'Replace All', all cffunction tags in the CFC will now have the access attribute set to remote. How easy was that? Gone are the days when you had to go through the entire file and update the tag attributes where ever required. If you specify an attribute which doesn't exist, then the attribute would be added to the tag definition. Action Set Attribute is used for both adding and updating the tag definitions. Click on Replace All and you will see that the comment is added before the tag block. Again, click 'Replace All' to add the comment at the end of every function definition. All the actions mentioned above can be performed in all the scopes. Please refer to my previous post where in I have describe various scopes available for both text and tag search.